MANCHESTER, Great Britain (Oct. 17, 2018) – Manchester is Ready…Are You? The stage is set for the 2018 edition of the Manchester Grand Prix, over 250 athletes will compete in eight different weight categories, from female -49kg to male +80kg. 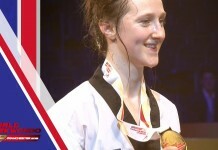 Many household names will be going for gold including home grown hero and double Olympic champion Jade Jones, the Korean duo, Tae-hun Kim and Dae-hoon Lee, as well as 20 year old Russian star, Maksim Khramtcov who is looking to make it four golds out of four in this years Grand Prix series following success in Rome, Moscow and Taoyaun. The live coverage of the Manchester Grand Prix will offer an immersive experience for fans around the world who will have the opportunity to watch the action all day, every day with access to every single fight, from the preliminary rounds all the way through to the final. New to taekwondo? Download the spectator E-guide HERE to get to grips with all the information needed on Taekwondo rules, athletes competing and the competition schedule in preparation for watching the 2018 Manchester Grand Prix. Home-grown hero Lauren WILLIAMS(GBR) – two time GP champion!